Model: The engineer's cab in the cab control car has interior details. The headlights and the marker light are maintenance-free LEDs. All of the cars have adjustable buffers. The 7319 current-conducting couplings or the 72020/72021 current-conducting close couplers can be installed on these cars. The cars come individually packaged. Total length over the buffers 107 cm / 42-1/8. DC wheel set per car 4 x 700580. 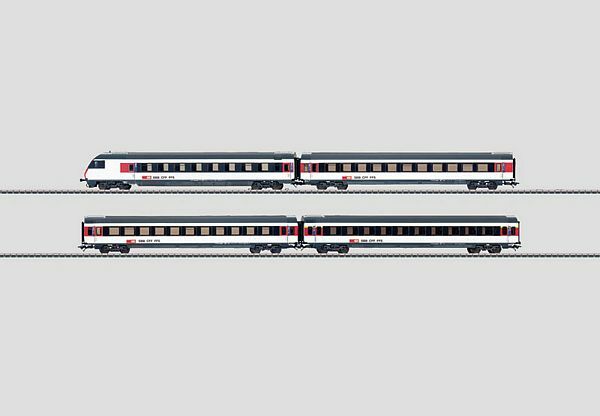 The right cars to go with models of the SBB class 460 locomotive, example: item no. 37460. The class 460 is the right electric locomotive for these cars and can be found in the Marklin H0 assortment under item no. 37460.